Dr. Paulson and the staff at CCDC have been serving the communities of central Wyoming for over thirty years. As the area’s longest running pediatric dental clinic, the clinic takes pride in serving three generations of Wyoming’s youth. The staff understands that a child’s dental appointments are not always pleasant and strives to create a uniquely fun, entertaining environment while successfully completing necessary care. Dr. Paulson’s office is equipped with arcade games, TV’s playing the latest kids’ movies, silly mirrors, and prizes/balloons for the kiddos after the completion of a dental appointment. 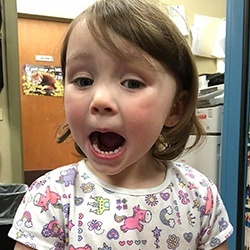 The kid-friendly personalities of the doctors and staff help alleviate dental anxiety, and in many cases, make the dental experience an enjoyable one. The Paulsons are also committed to the growth and facial development of their patients. The doctors have been trained extensively in interceptive orthodontic treatment and utilize growth and development strategies that can often prevent the financial burden of braces. The Paulsons take pride in working with families (financially and through consultation) to ensure the children of Casper can reach their most beautiful smiles. Special needs patients are also welcome at Casper Children’s Dental Clinic. We understand the dental experience can often be filled with much anxiety and headache. We utilize a patient-centered approach for helping our special patients and their families feel comfortable during dental check-ups and treatment. Our special needs patients and their families are scheduled, so they are the only patients in the clinic for their check-up and treatment visits. The individualized approach allows us to focus more time and attention on your special boy or girl. With over 100 years of combined experience working with central Wyoming’s youth, the staff at CCDC sincerely cares for the kids of the Cowboy state. Please contact us today to become part of the CCDC family. Each preventive care visit is important for keeping tabs on oral health. Here at Casper Children’s Dental Clinic we like to reward each child for having a perfect checkup. When their dental exam shows that they have been brushing and flossing and have no cavities to report, they become a member of our No Cavity Club! We want to create healthy smiles for Wyoming's youngsters. Lean on our experience in a wide variety of cases, including sedation dentistry and dentistry for special needs patients. We see toddlers through teens, and we're happy to work with you!